Manley Performance has brought its trademarked NexTek Valve Spring technology to the Chevy LS, Ford Modular, and Chrysler SB HEMI markets. 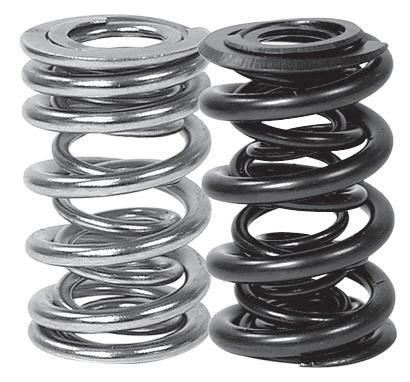 Manufactured from “super clean” Hi-tensile strength chrome silicon steel alloy, these springs offer winning performance, long term reliability and the ultimate value. Our proprietary multi-step heat-treating combined with our shot peening process minimizes load loss and offers superior fatigue life. Computer-aided modeling of application specific designs has enabled us to bring the very best springs to these niche markets. We’ve utilized ovate wire extensively with many conical designs to render the lightest, highest quality, most reliable springs available today; as well as adding a special polishing feature that helps further improve the fatigue life of the part.